Part 19 of Wonders of World Engineering was published on Tuesday 6th July 1937, price 7d. Part 19 includes a photogravure supplement showing the construction of the Huey Long Bridge across the Mississippi, illustrating the article entitled Across the Mississippi. 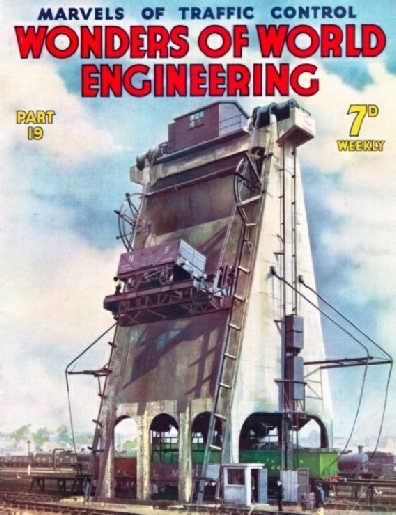 The cover of this week’s part shows the locomotive coaling plant at Doncaster, Yorkshire, one of the main locomotive centres of the London and North Eastern Railway. A truckload of coal is seen being raised to the top of the chute down which the coal is discharged into the tender of the locomotive below. The building of the Hudson Bay Railway and the establishment of the port of Churchill on the shores of Hudson Bay. This chapter is by Harold Shepstone, and is concluded from part 18. It is the sixth article in the series Railway Engineers at Work. Although the reciprocating engine has reigned supreme in railway work for over a century, it has certain limitations. In the turbine locomotive attempts have been made to improve thermal and mechanical efficiency. One of the most interesting features of rail transport has been the application of the turbine principle to locomotives. In this chapter C Hamilton Ellis tells how the principle of the steam turbine has been applied to locomotives not only in Great Britain but also in other countries. An interesting locomotive driven by turbines was produced little more than ten years ago by Herr Zoelly, after a remarkable series of experiments in Switzerland and in Germany. The most recent and the most varied developments of the turbine locomotive are largely due to the work of the Swedish engineer Ljungstrom. Two trunk railways and two great national roads have been united by the building of the Huey Long Bridge across the Mississippi near New Orleans, Louisiana. 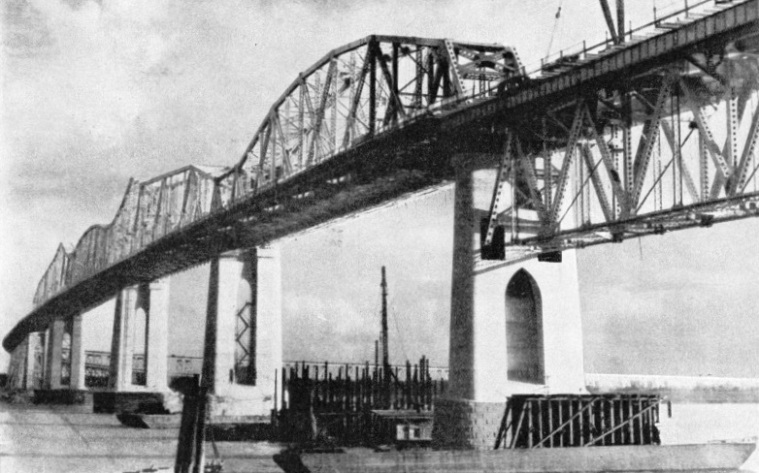 The bridge was opened on December 16, 1935. The great rivers of the world must necessarily be associated with major feats of engineering. They may be harnessed to supply hydro-electric power, they may be dammed to irrigate the surrounding country or to control the flood waters, and in almost every instance they have to be bridged. The River Mississippi, for instance, is spanned by twenty-nine major bridges between St Paul, Minnesota, and New Orleans, Louisiana. The most recent of these bridges was recently completed and named after the late Governor of Louisiana, Huey Long. It carries a great main road and an important railway and, with its approaches, has a length of four and a half miles. This chapter is by C Hamilton Ellis and is the sixth article in the series Linking the World’s Highways. THE CONTROL BOX - the nerve-centre of the automatic traffic signal mechanism. Its function is to translate the impulses received from the vehicle detector strips into the appropriate changes of signal lights. A network of complicated electrical apparatus, entirely automatic in its action, now controls the traffic flow at nearly every important road intersection in the large towns and cities of Great Britain. The enormous increase of road traffic in recent years has made the problem of traffic control, particularly in towns, of paramount importance. Enormous progress has been made in controlling traffic by means of light signals, and the operation of these amazing devices is described in this chapter by Howard Barry. The ingenious system of traffic light signals ensures that every vehicle can have free passage across road intersections with the minimum amount of delay. When a motor car, as it approached a crossing, passes over a detector strip, it sets into motion an ingenious electrical system which controls the lights not only according to their position at the time of impact, but also according to the speed of the vehicle. 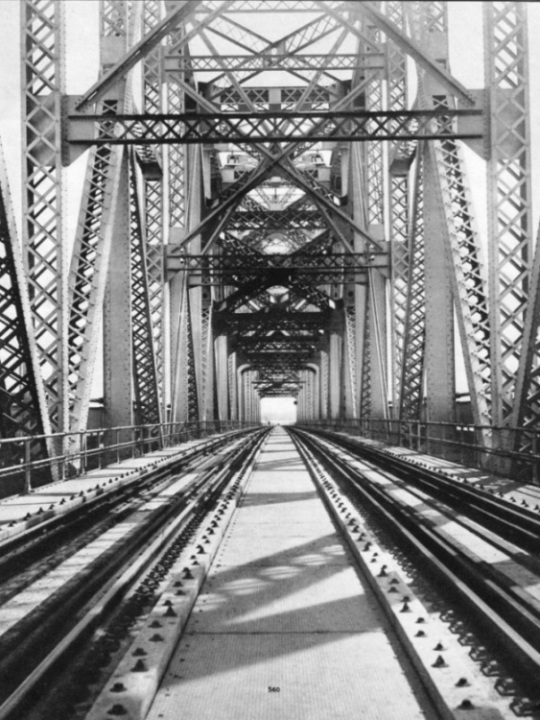 THE RAILWAY DECK of the Huey Long Bridge, seen through the main cantilever structure. The handrails of the upstream and down-stream roadways can be seen outside the truss members. These roadways are supported on brackets cantilevered out from the main members of the span. THE HUEY LONG BRIDGE carries a double railway line, two 18-feet roadways and two footpaths, each 2 ft 6 in wide. A clear headway of 135 feet is afforded midstream. This has necessitated long approaches which give the bridge a total length of four and a half miles. 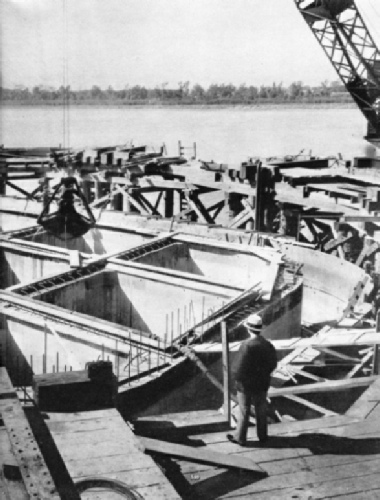 A CONCRETE CAISSON for the foundations of one of the main river piers of the Huey Long Bridge. Dredging operations are under way. Sand is being removed from inside the fifteen dredging wells of the caisson and the caisson settles gradually as the dredging progresses. The lower edge of the caisson was sunk to 170 feet below the low-water level of the river. A BRITISH TURBINE-DRIVEN LOCOMOTIVE at the head of an express passenger train. No. 6202, of the London, Midland and Scottish Railway, is a non-condensing turbine locomotive built in 1935. This engine, which has the 4-6-2 of Pacific wheel arrangement, is equipped with a 2,000 horse-power main turbine on the near side for forward running and with a smaller turbine on the off side for reverse running. No. 6202 is one of the most successful turbine locomotives ever built. 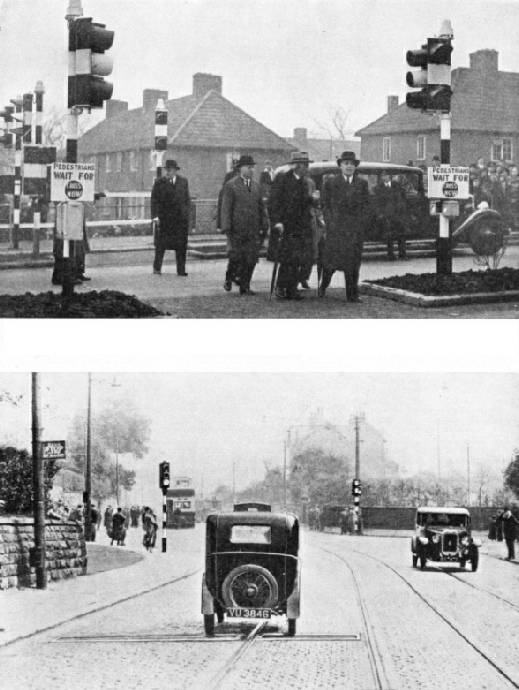 TRAFFIC SIGNALS OF SEVERAL TYPES are visible in this illustration, which shows Mr Hore-Belisha (right) inaugurating the installation at St Helier Avenue, near Morden, Surrey. Mr Hore-Belisha is operating the pedestrian signals by crossing the path of a light beam projected from the standard on the right to the photo-cells mounted in cases on the standard on the left. In the background are special signals for the cycle track at the side of the road. CROSSING THE DETECTOR STRIP, which signals the approach of a vehicle by transmitting an impulse to the control box. Detector strips are mounted flush with the road surface and the mechanism is hermetically sealed to make it immune from the action of rain or snow. AUTOMATIC SIGNALS FOR PEDESTRIANS are among the more recent developments in traffic control. 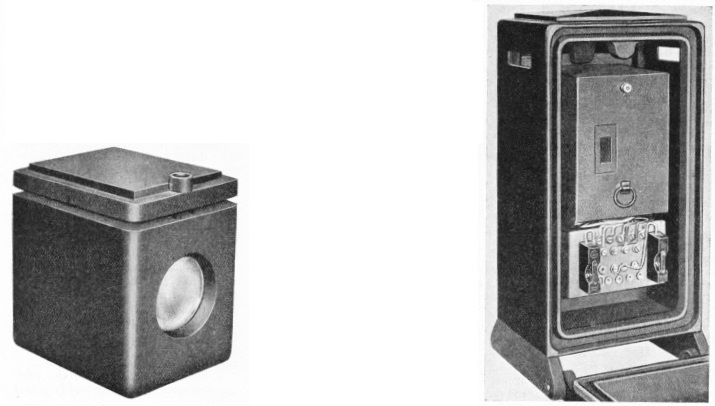 A light-beam projector (left) shines on a photo-electric cell mounted in a receiver unit (right), the two components being separated by a gangway through which pedestrians are “shepherded” by guard rails. Each interruption of the beam transmits an impulse to the control box and ensures that the signals will change at the first safe moment. 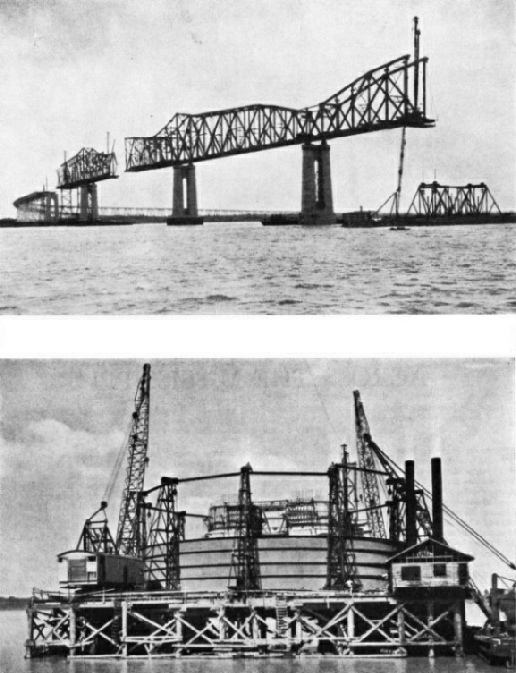 A FALSEWORK BENT, or temporary pier of steel, being erected under the 531-feet simple girder span of the Huey Long Bridge. 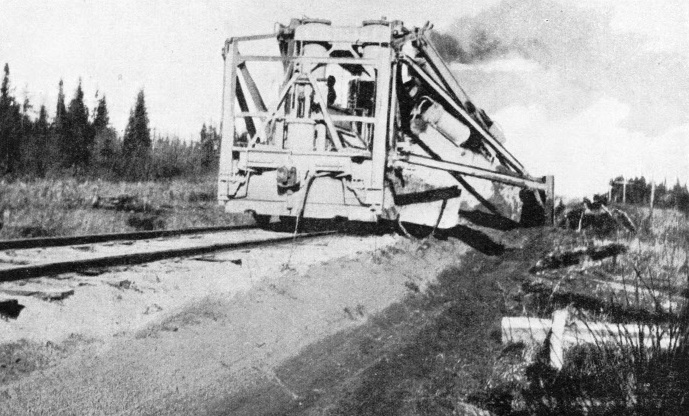 Bents were temporarily placed under the cantilever section as well. The bents were founded on 12-in piles driven down into the firm ground below the bed of the river. The average weight of the piles was 85 to 100 lb. DISMANTLING one of the steel shells used in the construction of the main piers. The shell was circular, 121 feet in diameter, and extended from above the surface of the river at high water, down to the river bed and into it for a distance of from 10 to 15 feet. 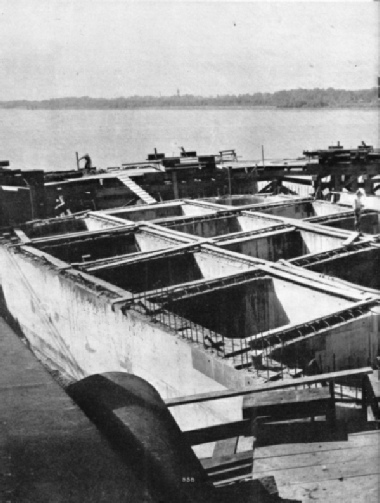 After the shell had been placed inside the falsework shown, it was filled with sand, forming an island through which the caisson was sunk. BUILDING OUT THE SUPERSTRUCTURE from the main river piers. The steelwork was built out in either direction from the pier. 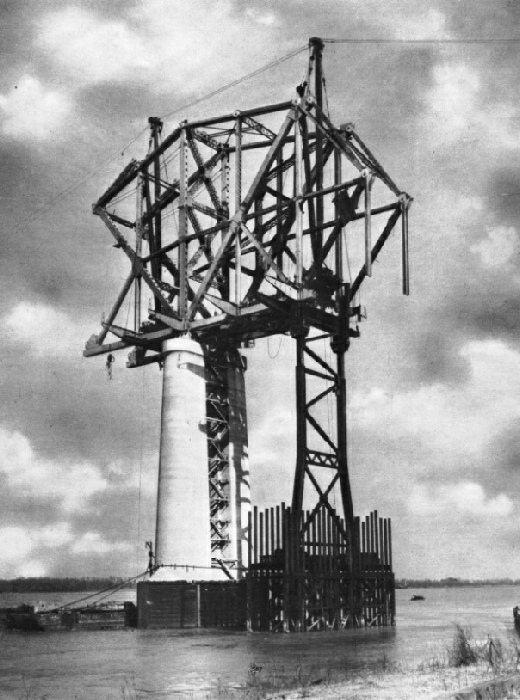 The work proceeded in such a manner that the weights on either end were balanced over the pier and the bent of the falsework shown on the right side of the concrete pier shaft. BUILT AT ESSEN FOR THE GERMAN STATE RAILWAY, this 4-6-2 locomotive has turbines of the Zoelly type. The main turbines and the transmission gearing are placed at the leading end below the smokebox. There is a separate turbine for reverse working, the gearing being between the two turbines. The condenser is placed behind the turbines and between the boiler and and the frame. The driving wheels are of 5 ft 5 in diameter. The boiler supplies steam at a pressure of 225 lb per square inch. 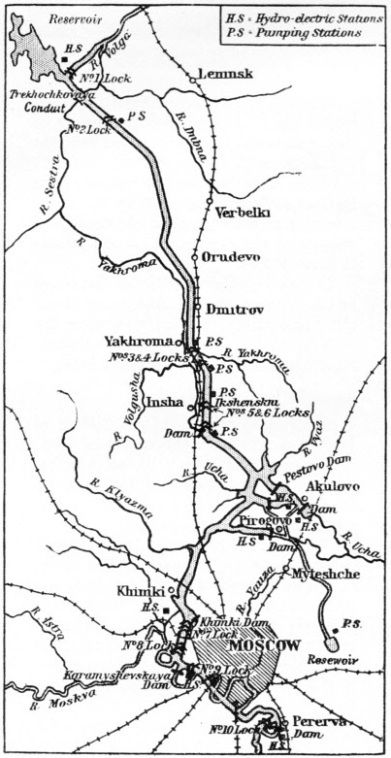 Part of an extensive system of ship canals linking the great waterways of Soviet Russia with the sea, the Moskva-Volga Canal enables vessels to pass from the Volga to the Moskva, the river on which lies the capital city of Moscow. On May 1, 1937, one of the greatest engineering achievements of Soviet Russia was inaugurated. This is a canal, nearly eighty miles long, which links the River Volga with the Moskva River. Considerable difficulty is always experienced with the English spelling of Russian place names. In Russia the city of Moscow bears the same name as the river on which it lies. This name, directly transliterated, is spelt Moskva, and strictly speaking Moscow should be called Moskva. The generally accepted spelling of the name, however, is Moscow, though the river is referred to as the Moskva. This chapter is by Sidney Howard and is concluded in part 20. THE LOCK at Karamyshevo, near Moscow, No. 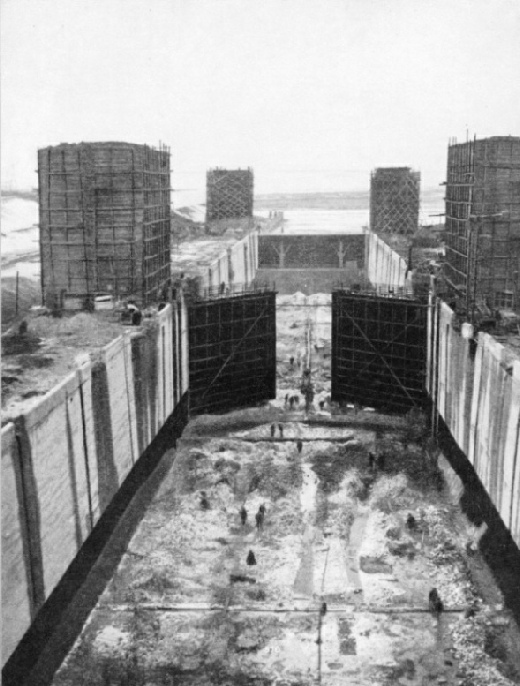 9 in the series of locks on the Moskva-Volga Canal. All locks on the canal route have the same dimensions: - each of them is 951 ft 6 in long, 98 ft 6 in wide and 18 ft 4½ in deep. THE MOSKVA-VOLGA CANAL has a length of about eighty miles and links the Moskva River with the River Volga in the north. There are ten locks on the traffic route and a number of pumping stations, hydro-electric stations and barrages.